After four years, Windows 10 updates are still frustrating. Credit where it’s due, though: Microsoft is taking steps to improve the process. But even if and when Windows Updates become more stable and less intrusive, they’re still a confusing mess to manage. That’s the definitive conclusion from a newly published study, which also contains a flowchart of Windows 10 update behavior that may just melt your brain. Spotted by ZDNet, “In Control with no Control: Perceptions and Reality of Windows 10 Home Edition Update Features” is written by researchers Simon Parkin, Jason Morris and Ingolf Becker from University College London. In a nutshell, the paper examines whether or not the tools Microsoft provides for managing updates are appropriate for the average computer user. 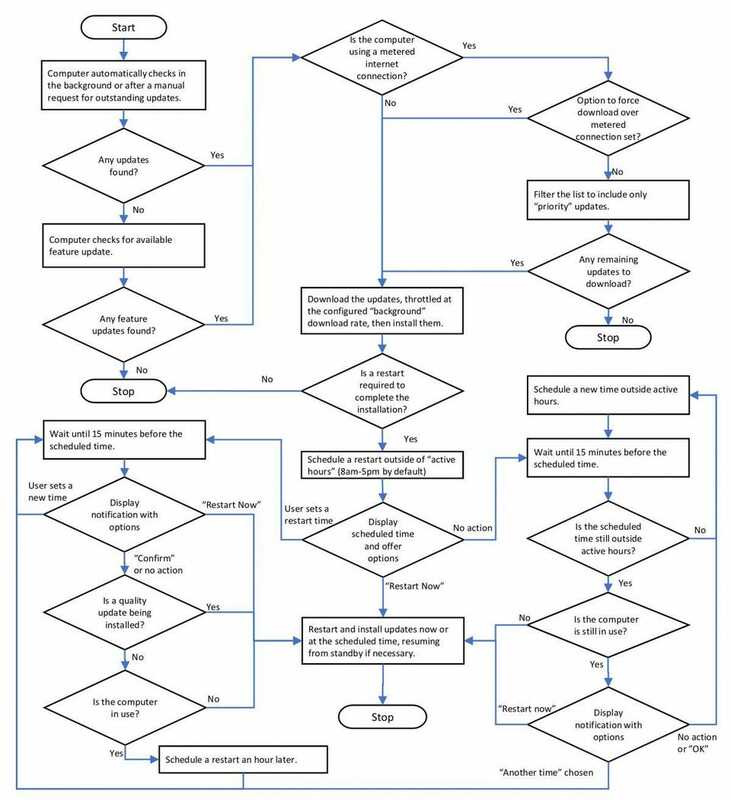 While the primary focus of the paper is documenting behaviors and contrasting user expectations versus actual experiences with Windows Updates, what caught my attention is the update model that was built, as seen in the flowchart below. It’s certainly not straightforward. To create the flowchart, the authors installed a fresh copy of Windows 10 on a virtual machine, then took a snapshot. When future updates were released, the snapshot was restored to allow the virtual machine to download them. Just before those downloads completed, a second snapshot was taken. The researchers restored the second snapshot multiple times, and recorded the various behaviors and available paths for dealing with and installing those updates. Hilariously, the authors acknowledge that the flowchart may not even represent the complete picture. Also of note is that one-third of the survey respondents worked or studied in a computer-related field, and 96% of the respondents had extensive experience with a Windows OS prior to Windows 10. Despite that, 29% of users reported that they had no idea the purpose behind the updates they were installing. 37% of them feared their computer wouldn’t work properly after installing updates and restarting. It’s a long read, but a fascinating and exhaustive study that repeatedly demonstrates that Microsoft has chosen non-sane defaults when it comes to settings like Active Hours. The researchers also conclude that Microsoft must give users more advanced notice about pending restarts, and be more transparent about how long feature updates can take to install. But I keep coming back to the insanity of that flowchart. This doesn’t paint the picture of an elegant, hassle-free, user-friendly update model.